Conversion coatings are lubricants that are used to protect different types of metal corrosion due to environmental factors such as humidity and salt spray. 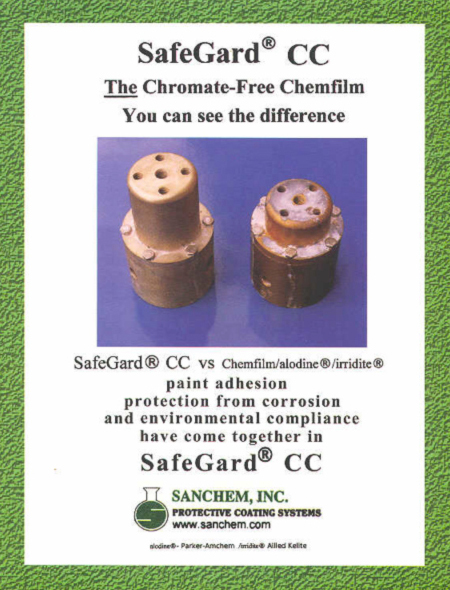 Painting aluminum, zinc, and magnesium is easy with Sanchem's SafeGard CC conversion coatings, which are all available for direct purchase from Sanchem. Use SafeGard CC -3400 rust converter for surface finishing of aluminum. It will prevent aluminum corrosion and gives a golden alodine color, or clear if desired. RoHS compliant SafeGard CC-3400 prevents corrosion due to humidity, salt spray and is electrically conductive. All SafeGard CC rust converter products are used for both unpainted (corrosion resistance) and paint/powder applications.